The MTO106 transformer ohmmeter is an easy-to-use, line-operated instrument specifically designed for safe and accurate field measurement of winding resistance in smaller transmission and distribution transformers. It has dual channels with a measurement range and accuracy suited to provide accurate information about the vast majority of power transformers, reactors and instrument transformers. The test current can be manually set in five different ranges to fit transformers of various sizes. The instrument is exceedingly simple to use, which minimises the need to train users. It has a single selector switch for test current and a single button to activate the test cycle. The instrument is also supplied with test leads fitted with Kelvin clamps that allow for a single, one-time connection to the unit under test. The test leads are 10 m (33 ft) in length to allow for easy testing of pole mounted transformers. 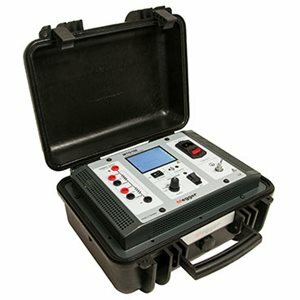 The compact and lightweight instrument is housed in a rugged plastic case for true portability. When closed, the case is rated IP67, which means your instrument will always arrive safely to the testing location even in the harshest conditions. Users are protected by an automatic discharge function that de-energises the transformer winding at the end of every test. The discharge function is passive and thus also functions if there is an inadvertent loss of power or if the test or mains leads are accidentally pulled.